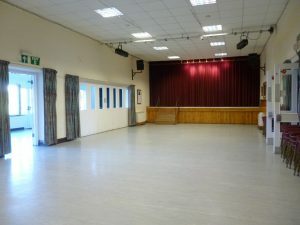 is the core of the premises and has a conventional layout with a raised stage at one end. 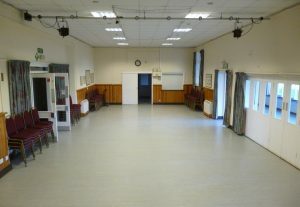 The hall has an area of approximately 88 square metres, being 14.6m long by 6m wide (48ft x 20ft), excluding the raised stage. 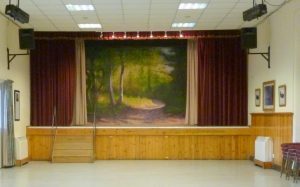 The stage is 6m wide by 3.6m deep (20ft x 12ft) and can be accessed from both sides at the rear or by means of moveable steps from the front. The licensed capacity is 200 for close seating (e.g. 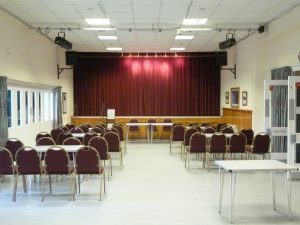 stage performances) and 100 for seating at tables, although a more comfortable capacity might be 120 and 80 respectively. Details of other items that may be of use can be found here.